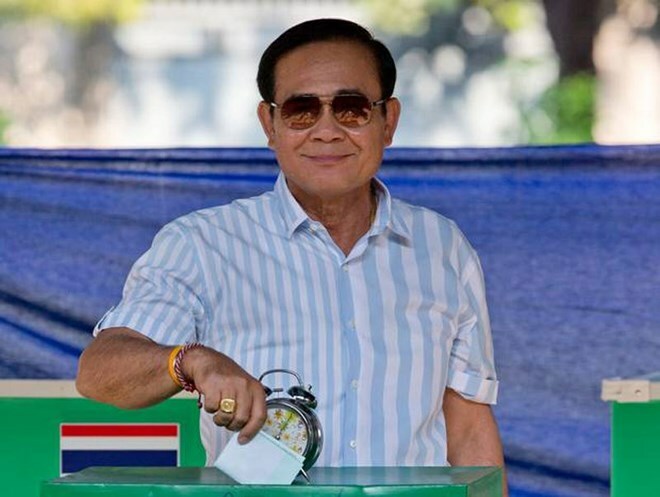 Bangkok (VNA) – The ruling party, the Palang Pacharat of incumbent Prime Minister Prayut Chan-o-cha was leading the general election in Thailand as of late March 24, according to initial results announced by the Election Commission. The commission said after 89 percent of votes had been counted, the ruling party had 7 million votes, followed by the main opposion, the Pheu Thai with 6.6 million votes. Meanwhile, the announcement of the preliminary vote count was postponed to 10:00 am on March 25 instead of 8:30 pm on March 24, Chairman of the Election Commission Ittiporn Boonprakong said, giving no explanation. The Democrat Party led by former Prime Minister Abhisit Vejjajiva had admitted defeat in the election. Abhisit had resigned as head of the party after the election loss. The general election in Thailand, the first since the military coup in 2014, took place on March 24 with over 50 million people eligible to cast votes.